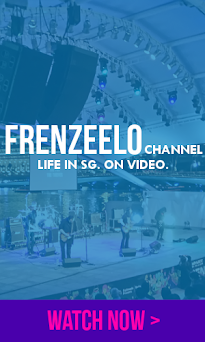 Right at Singapore's first eco-friendly shopping mall, also known as City Square Mall, is a restaurant which serves different kinds of pastas, main courses, Western dishes, delectable desserts and mouth-watering Buffalo Wings. It's called Breeks Cafe and it's unlike any other restaurants you have visited before. Located right in the heart of Farrer Park, the lesser-known area of Little India, is filled with lots of Indian-oriented shops and restaurants. You'll find shops selling Indian merchandise, the mega department store known as Mustafa Centre and Indian restaurants like Komala's located just right across the street from Farrer Park MRT Station. But we're not going to concentrate on that now, we're going to concentrate on City Square Mall and the awesome Breeks Cafe that's in the mall. First up, it's the Baked Dory. You know, in my previous posts, I kept talking about my love for Fish and Chips and if you read my previous food posts, you'll know that I got Fish and Chips at various restaurants like Mad Jack and Manhattan Fish Market. At Breeks Cafe, I got something a little different. 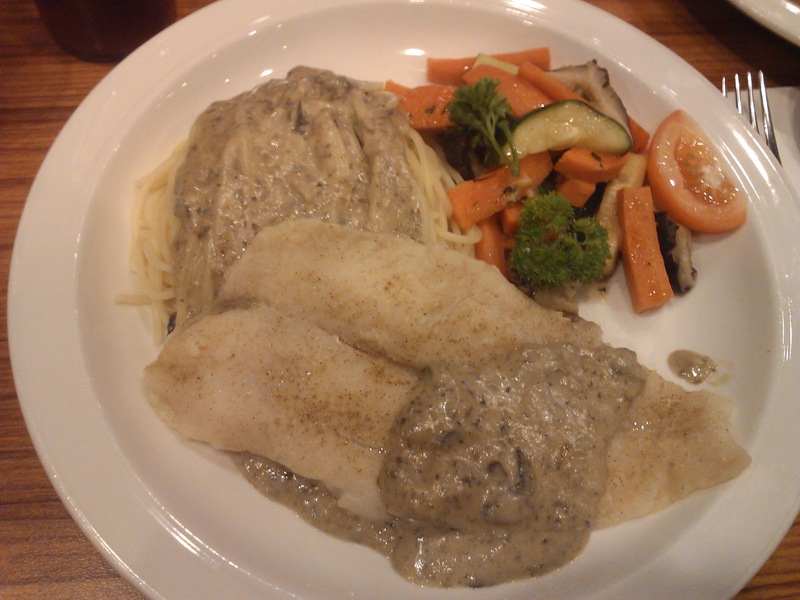 It's called the Baked Dory which is basically baked Dory fish with mushroom sauce which they smothered around the fish and pasta. At the side, there's some fresh salad. Well, what can I say about this? I can say that I did not regret getting this over the Fish and Chips because it was so delicious. The Baked Dory was cooked properly as it was soft and it melted in my mouth. The mushroom sauce was also creamy and tasty and it complemented the Fish and pasta. The pasta was a great addition to the baked pieces of fish and for those on a diet, you should get the Baked Dory because it's baked and not fried. Not only that, it comes with a side of fresh salad. It's also a great alternative to Fish and Chips or any other fish dish. Speaking of Fish and Chips, this will be another article that will feature a plate of Fish and Chips. This was the main course that my mother ordered at Breeks Cafe. The Fish and Chips were delicious and crunchy but unlike other Fish and Chips that I ordered, this one was breaded and not battered. When it's breaded, it's much more crunchy than the battered counterparts. However, I still think that the best Fish and Chips are still the battered versions. Anyway, Breeks Cafe's Fish and Chips was big and generous in terms of the portions served and that the 'chips' was actually criss-cut fries. I love criss-cut fries. They have a unique patterned shape and it's all golden brown, crispy and spiced. One thing I noticed about the fried fish that was served (you can see it in the picture right above) was that there were 2 lines across the fish. I don't know what's the purpose of that, maybe it's for decorating purposes. 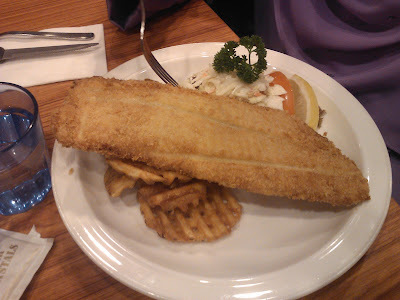 The fish was great and it was somewhat similar to Swensen's Fish and Chips. There's also fresh salad served at the side if you're into that sort of thing. 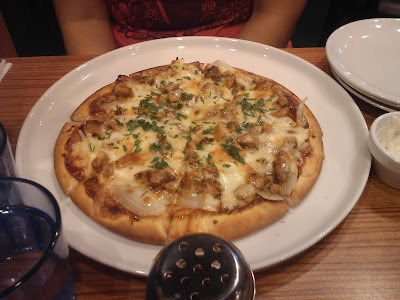 Lastly, my sister got the pizza. Not just any pizza, the BBQ Chicken Pizza in the size of 9". The BBQ Chicken Pizza has that smokey BBQ sauce that I enjoyed and has these chunky pieces of chicken. The fluffy and crispy crust along with the melted cheese and herbs make it a joy to eat this pizza. Big eaters should take note that the pizza's quite small and that the slices that are cut were also quite small. The pizza's great for sharing among two or three people. Other varieties of pizza are also available. 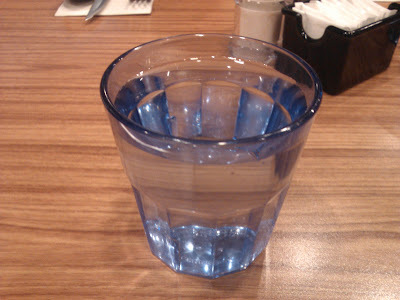 You can also request for a glass of plain water if you want to wash down all that saltiness that's in your mouth before washing it down with sweet drinks and desserts. Breeks Cafe is definitely a great place to check out and dine. All the food's here is delicious especially the ones I just mentioned. On my previous visits to Breeks Cafe, I got the Buffalo Wings which was indeed delicious and worth getting if you're that kind of person who loves Buffalo Wings and especially those who are wanting to try Halal Buffalo Wings. Breeks Cafe also has mock cocktails and various kinds of desserts and ice blended drinks. The prices here are steep so i suggest you to eat here once in a while or if you have money. Breeks Cafe is available islandwide with outlets at City Square Mall, HarbourFront Centre, Northpoint and much more. Do bring your family or friends along especially if they love Buffalo Wings or Western dishes.